Unless you've been under a rock, you have heard that Grey's Anatomy Season 15 Episode 15 will be a record-breaking hour of television. The series will be the longest-running primetime medical drama! 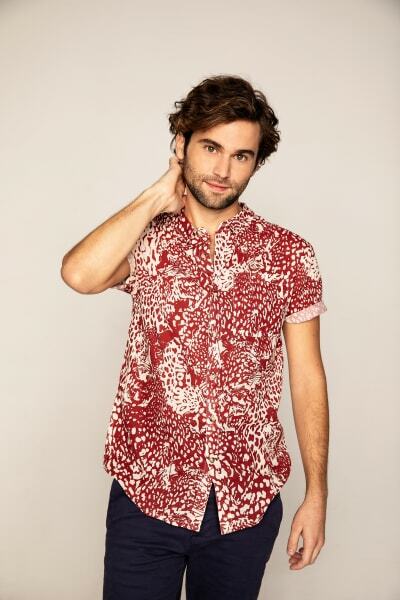 It's quite a milestone, and before such a momentous occasion, TV Fanatic was beyond fortunate enough to speak with one of the series' latest breakout stars, the charming and funny Jake Borelli who plays the lovable Levi Schmitt. During our phone interview, Borelli spoke about that huge milestone, what it was like being part of it, and his character's growth and relationship with the handsome Ortho god, Nico. 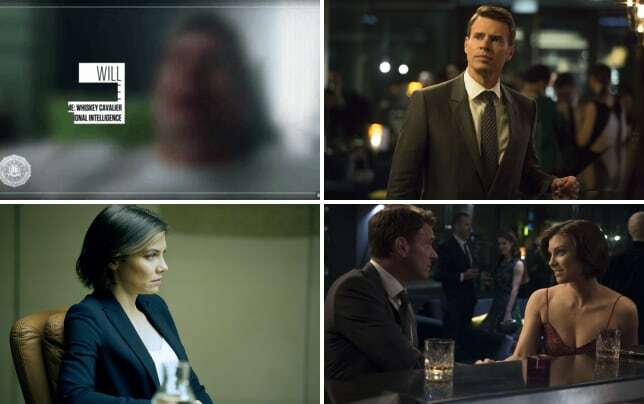 What can we say about Borelli and the series? For starters, it's no exaggeration whatsoever when I say that he's one of the warmest, funniest, and humble people I've had the pleasure of speaking to, and his inviting personality puts you at ease and makes you feel like you've known him for years. He's a natural storyteller, down to earth, and charismatic, and we spent just as much time laughing as anything else. Levi Schmitt has become a standout intern. He quickly became a fan-favorite with his awkward, bumbling, klutzy persona. We asked Borelli if he was surprised by the overwhelmingly positive fan response to his character. He was, and he finds the fandom response touching; it was "more than I ever could have anticipated." 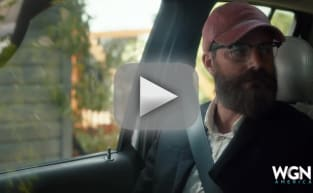 The character resonates with many, and the actor has some opinions about that. "In the beginning, he [Levi] has always been super relatable. He was the fish out of water coming into the scene with all of these surgeons not knowing anything." Levi's sense of being a newbie in an established world is "something that everyone can relate to" and Borelli himself is invested in Levi's growth and how the intern "fails but can get back up again." Related: 38 Hottest 'Ships of Fall 2018! Levi's determination and ability to bounce back every time is just one more thing Borelli enjoys about his character. It's true; it's an enjoyable quality of the character, and it has made his journey rewarding to watch. Despite being an intern and lacking prominence compared to others, Levi has had a remarkable arc, and the character has grown and matured in the past season and a half. It's something I pointed out, and Jake agreed. Levi's real turning point for a character was during Grey's Anatomy Season 15 Episode 8. It was Levi's big coming out moment and saw the former timid, awkward intern who typically displayed a lack of confidence assert himself and demand respect and consideration from Nico. 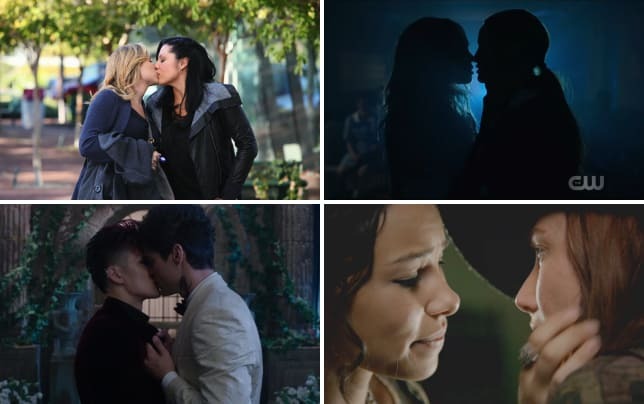 On a series that has many poignant moments spanning 15 years, Levi's coming out moment in which he openly acknowledged his sexuality and embraced it and what it means is one of the most moving and powerful moments of the series and one of Borelli's best performances to date. Borelli responded to the praise with sincere gratitude and humility, but he knew the importance of that moment. When he first read the scene, he cried; and the actor acknowledged how much that scene touched him personally. It also hit him that he would be the one to say those words and share a unique and momentous moment with the world. The monologue itself "took him back" and reminded him of "feelings that he felt before." When asked about his most challenging scene, Borelli mentioned that coming out moment. "I felt the weight of it, and I knew that it was going to touch and affect a lot of people. There was a lot of excitement and anxiety behind that scene, and I'm so happy with how it came out." It's a moment of which he should be proud. 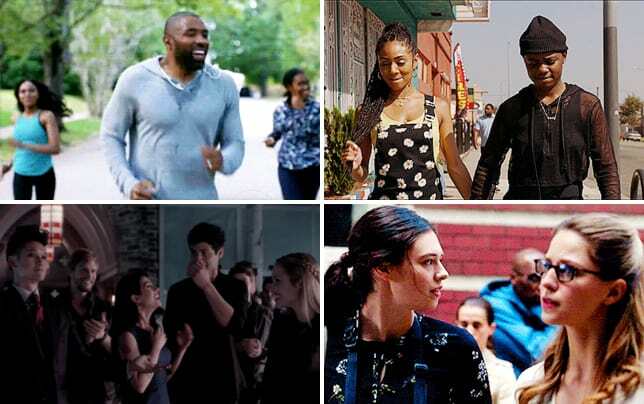 Everyone was abuzz with their reactions to that exceptional scene, and it's still one of the most talked about moments from the season thus far. It was distinctive for the character and Borelli's breakout moment. The importance of that speech and that moment isn't by any means lost on him. He recalls for months he was flooded with countless messages on Instagram and with tweets. To which his response to those and the reactions of fans who felt seen and connected is that it's all "heartwarming." Schmico has taken off, and it's no secret that it has become of the most popular 'ships currently on the series. We wouldn't be TV Fanatic if we didn't pry and attempt to get some information on what the future has in store for Levi and Nico. Nico and Levi have become closer, and it appears as though the couple is serious about one another. However, when will Levi introduce Nico to his mother? Did Levi come out to his mother yet?! Levi has not shared his romantic life with his mother yet. "We have some mother figures that we've been talking about," Borelli teases. "Levi has a very interesting relationship with his mother. She's very sheltered, and they have a very close/safe relationship, and as of right now, Levi hasn't come out to his mother yet. I hope that one day we get to meet her on the show and see her reaction to all of this... it will probably complicate things a little bit." As for Nico and Levi, being a Schmico fangirl, I pointed out that the two of them seem to be one of the most healthy relationships on the series, something that elicited a laugh given the show's history of relationship drama. According to Borelli, they seem healthy now, but the couple is in the early stages of their relationship and living in a bubble. It may be interesting to see how they are when others find out about their relationship. It's strange to think that others haven't figured out those two lovebirds are together. Alex and Link are already aware, and they can't hide their heart eyes from one another, which is a comment Jake found amusing. Borelli describes filming this milestone episode as "nuts." 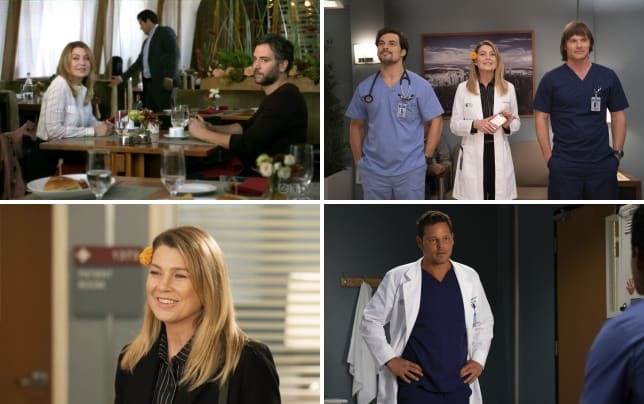 Most of the crew on Grey's Anatomy have worked on the show for the entire tenure, so everyone was buzzing with excitement over this milestone, and their pride in this accomplishment was palpable. Grey's Anatomy Season 15 Episode 15 will be a very special episode. Borelli wouldn't give me much about what to expect from the hour. "Go to ABC.com and check out the promo," he teased -- directing me to that special promo that revealed absolutely nothing. We'll have to wait and see! Although, the creativity of the promo with iconic Grey's lines built the anticipation. I teased Borelli that if they use a similar promotion for the next big milestone -- or on a Grey's Anatomy Season 30 starring Zola Grey-Shepherd -- maybe some of his lines will make it on there too! "That would be awesome," he laughed. He may be a new character, but Levi has already made a splash and his presence known. 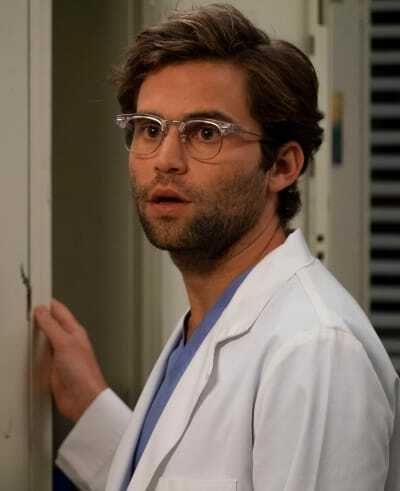 According to Jake, he was a bit too young to watch the series when Grey's Anatomy first aired, "I wasn't allowed back then," though he recalls his mother watching it. After he booked the gig, he spent a whole year binge-watching the series and becoming as obsessed with the series as the rest of us. He is a fan of Lexie, and also loves Mark. Oh, and according to him, "Alex Karev will always have a special place in my heart." But his taste is not without controversy. He likes Penny, you guys! Penny!!! "I know," he laughed. Speaking of classic characters, I had to ask him about the comparisons to George. Many (myself included) often compare Levi to George. He gets that a lot, "especially last season," he said, making us recall the intern who rivaled 007 with his plethora of glasses slip-ups and other unfortunate things. No worries, he loves it, and he considers George an iconic character, so the comparison is nothing but flattering. We shared our appreciation for the nerdy types, but the bad news (for me, at least) is Levi may be sticking to the contacts for a while. Although, Jake said he wouldn't mind if they made the occasional comeback. "Glasses" is glassless. Levi had quite the glow up, so it suits the trajectory of his character, but dammit, he'll always be "Glasses" to me! Jake's hopes for Levi are simple. He wants the young intern to "continue to thrive and flourish and develop into a fantastic surgeon. He's surrounded by all of these amazing doctors, and I would hope that he becomes one of them." Levi may very well be on his way! He's already showing a knack for ortho, but Borelli reminded me that it's still too early for the interns to pick their specialties and right now they're getting a feel for everything. When asked who he would want to work with more on the show, he said Caterina Scorsone. "Levi hasn't had the chance to work in Neuro yet, and I would love for him to work in Neuro. Also, [Caterina] is one of the nicest, sweetest people ever." If you're curious, that did lead to some Caterina and Amelia gushing, and Jake was not exempt from shedding some tears while watching Amelia's breakdown during Grey's Anatomy Season 15 Episode 14 with his parents. 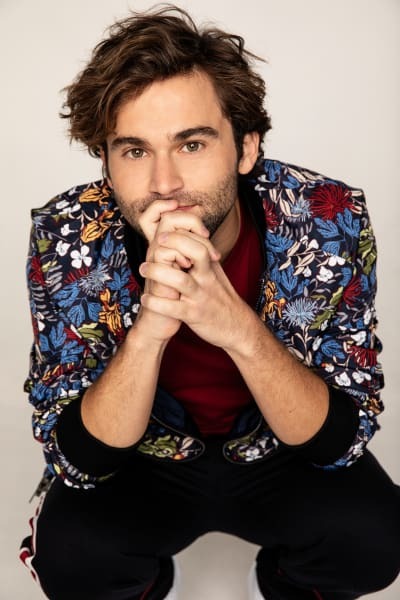 If there was one thing gleaned from this lovely interview with Jake Borelli it's that he's so enthusiastic and loves his job. 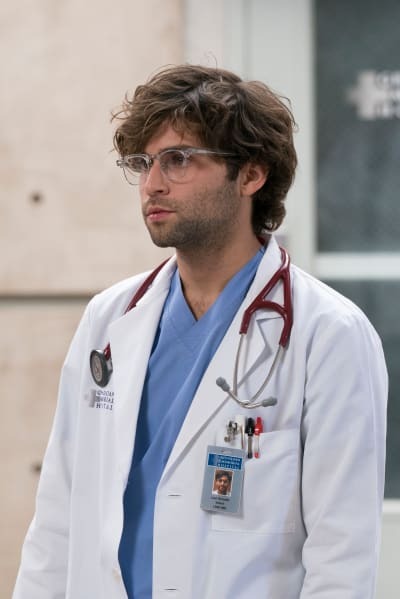 If you ask him which scenes he likes to film the most, he adores the medical scenes and enjoys learning about medical jargon, techniques, and tools. He describes it as "the most fun he has," but you need only hear the passionate way he speaks about many of the things he does to know that he's every bit as excited when discussing all the character growth, interactions and more. Borelli regaled us with a particularly funny tale of filming one of those classic intern scenes in the basement that included Helm goofing around with Levi and him getting back at her and running away, and much like his character, Borelli is a bit of a klutz. "I'm running, and I just eat it." By the time the scene wrapped, there was an unscripted faceplant after Borelli fell in front of everyone including director of the episode, the Debbie Allen. Debbie Allen rushing to you and asking "are you okay, honey?" (he gave us his best Debbie Allen impression, which was as funny as it sounds), makes everything better! It still made for a memorable and on brand scene. If you're curious about how similar he and Levi are aside from being clumsy, Borelli says that he has been playing the character for two years, and sometimes, even he can't tell which parts are him and which parts are Levi. He says they're both trying to prove themselves, and "there are a lot of parallels between him coming into this hospital and being the new kid on the block, and trying to prove himself and climb the ladder. That's exactly what I'm trying to do too -- coming into this series that is established already and feeling inspired by everyone." He described coming into the show "like jumping onto a moving train, and the train has been driving for 15 years," but it's a welcoming environment and everyone is super nice. As far as Jake's TV obsessions? Well, outside of Grey's Anatomy, of course, he loves the Great British Bakeoff and Project Runway because of the competitive sort of reality-drama, and he just got into Atypical, too. 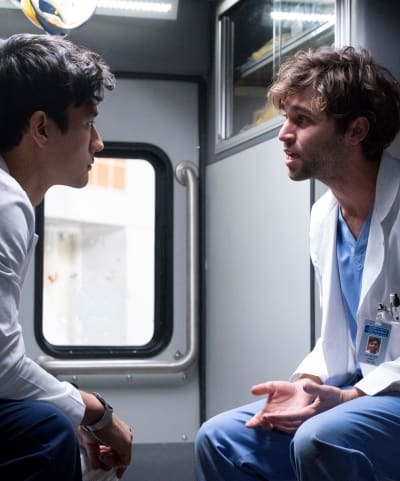 OK, Grey's Fanatics, I hope it was as enjoyable learning about Jake Borelli as it was speaking to him. Are you looking forward to the milestone episode? What do you hope to see from Levi in the future? Are you a diehard Schmico 'shipper? Grey's Anatomy's 332nd episode airs this Thursday at 8/7c on ABC. 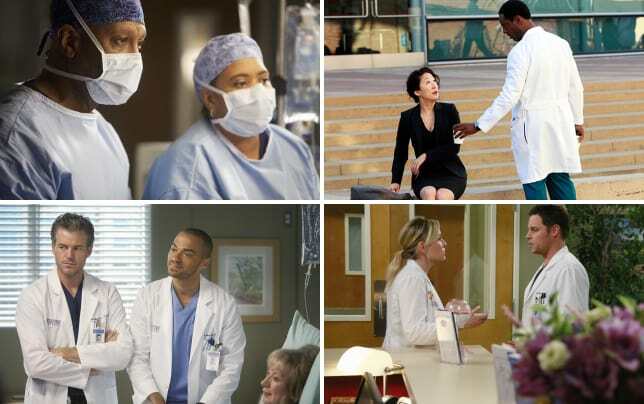 Don't forget; you can watch Grey's Anatomy online here via TV Fanatic anytime!